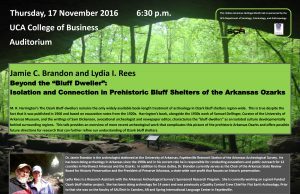 On Thursday, November 17th Dr. Jamie Brandon and Lydia Rees will give a public talk entitled “Beyond the Bluff Dweller: Isolation and Connection in Prehistoric Bluff Shelters of the Arkansas Ozarks” on the University of Central Arkansas campus in Conway. The talk will be held in the UCA College of Business Auditorium at 6:30 pm and is sponsored by the UCA Department of Sociology, Criminology and Anthropology as a part of the college’s Native American Heritage Month events. Poster for the UCA talk. Click for a larger image. 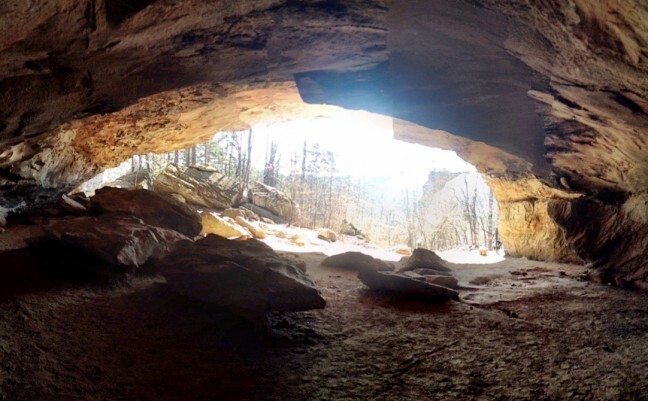 This is just one stop in the fall 2016 “Beyond the Bluff Dweller” tour which has included talks at the Boone County Museum in Harrison (8/29), the state-wide Arkansas Archeological Society meeting (10/01) and several Society Chapters (Arkhoma Chapter, 9/15 and Tunican Chapter, 10/04), the North Central Chapter of the Arkansas Master Naturalists at Bull Shoals Lake (9/17), the Ozark Symposium (9/24), and the Tahlequah Archeological Society in Oklahoma (10/04). Following the UCA talk this month, the final stop on the Fall 2016 “Beyond the Bluff Dweller” tour will be a talk to the Ko-ko-ci Chapter of the Arkansas Archeological Society in Fayetteville, AR on December 13. For more information, contact Dr. Duncan McKinnon, UCA Department of Sociology, Criminology and Anthropology.